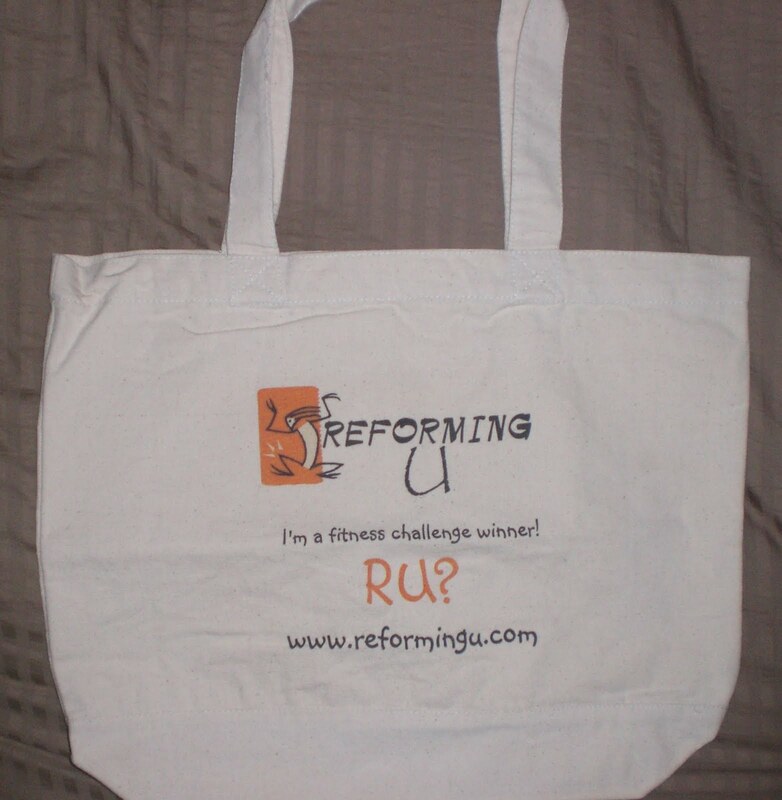 Meet your trainer, Sheila, and her business, Reforming U. Success can be yours! Learn effective ways to reform yourself through a lifetime of fitness and healthful living. Congratulations, Immy! 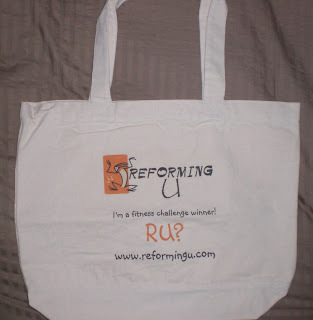 Our Australian friend will be getting a Reforming U tote that can only be won through our challenges and contests. Let's hope she'll share a photo of herself with it once she receives it. Time to get back to the quiz to find out the correct answers, learning more about healthy nutrition. 1. What does RDA stand for? The correct answer is B. RDA or Recommended Daily Allowances are created by the Food and Nutrition Board of the National Academy of Sciences/National Research Council. It is an estimate of the daily amount of a nutrient MOST people need in order to stay healthy. 2. According to MyPyramid.gov, what are the five basic food groups? The correct answer is D. For more information about each food group, click here. 3. According to the 2010 Dietary Guidelines for Americans, which food and food components should you decrease? The correct answer is D. All of these food components can interfere with maintaining your health and a healthy weight. 4. According to the 2010 Dietary Guidelines for Americans, your grain intake should consist of whole grains at least what percent of the time? The correct answer is B. Look for products made from whole grains such as whole grain bread, pasta, brown rice, etc. When buying packaged grains, look for the first ingredient to be a whole grain, such as whole wheat. Also, even though the guidelines urge you to ensure 50% of your grains are whole, it wouldn't hurt to exceed this percentage! The correct answer is C. Eating foods rich in Vitamin A will help you maintain normal vision, reproduction, and immune functions. How did you do? How does this compare to your current diet? Today is the perfect day to start thinking about healthy nutrition. In fact, don't just think about it, take action! National Nutrition Month! Win a PRIZE! Post your answers to the questions either as comments to this blog here, or on the Reforming U Facebook page as a comment to this blog post link. All who comment with answers will be entered into the contest, with a winner picked at random (you know, the name in the hat thing...). 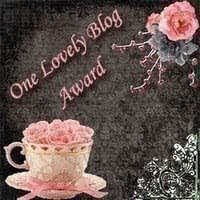 The cutoff for entrants is 5:00PM Central Standard Time on Monday, March 7, 2011. Your name will only be entered in the drawing once; however, feel free to interact with each other several times in the comments. Ready? Ok, here's the quiz! 1 - What does RDA stand for? 2 - According to MyPyramid.gov, what are the five basic food groups? 3 - According to the 2010 Dietary Guidelines for Americans, which food and food components should you decrease? 4 - According to the 2010 Dietary Guidelines for Americans, your grain intake should consist of whole grains at least what percent of the time? Be sure you post your answers! If this quiz is popular, I might be inspired to create further contests, giving you more chances for some awesome prizes. First, cut the spaghetti squash in half length-wise and clean out the seeds/guts. Spray a cookie sheet with cooking oil and bake with the cut side up in the oven at 400 degrees for about an hour or until it is tender when pierced with a fork. Cut up the rest of the veggies into similar size pieces, spray a frying pan with cooking spray and saute everything. Be sure to start with veggies that take longer to cook and add fast cooking produce later. When the veggies are nearly done, transfer to a stock pot, rinse out the pan you used to saute them with some of the chicken stock, and add to the veggies along with the rest of the stock. As you can see, this recipe isn't an exact science. Feel free to switch out the veggies as you like. Experiment and have fun! Let's face it. Exercise isn't easy, it isn't everyone's favorite thing to do, and it isn't always our top priority. Ironically, if you make exercise a consistent part of most days, all the obstacles you find that prevent you from doing it will fade away. You'll feel more energetic and be able to tackle your busy schedule with more vigor and a positive attitude. You'll feel accomplished and proud. And, most important of all, you'll be taking care of yourself, allowing yourself to be healthy and ready to help those around you. Try these tips for some of the obstacles my friends listed when they completed the sentence above. Our attitudes are part of a vicious circle. We start to feel negative. In turn, we begin to treat ourselves badly, which feeds that negative energy and sends our attitude spiraling downward. Break the cycle with some exercise, introducing positive energy into your world. If you can't bear the thought of working out for a whole hour, give yourself ten minutes. Get started and allow yourself to stop after ten minutes. Chances are, once you get that far into it, you'll keep going. Remember, you aren't the only one. We all suffer from poor attitudes from time to time. Give yourself the gift of health to keep your poor attitudes to a minimum. Sometimes it seems like everyone around us has it easier than we do, right? Either you have a friend who can seem to eat anything under the sun, remain inactive, and still be at a healthy weight. Or, you see others achieving a healthy weight with seeming ease. Perhaps you feel like your journey is too long and you'll never get there. (Or, all three, plus more!) It is important to remember a few things in this situation. Not everyone who appears to be at a healthy weight is actually healthy inside. Even though some people make exercise and eating right look easy, I can assure you they don't feel that way. It is important to always enjoy your journey along the way, rather than having tunnel vision on the destination. Life is all about living. Celebrate your achievements as they happen. Comparing ourselves to others is always a recipe for disaster. Get up each day and promise yourself that just for today, you will be kind to yourself. Consistent exercise will give you more energy, allowing you to handle your hectic schedule better. Take advantage of any "down" times, such as lunch, waiting for kids as you drop them off and pick them up from activities, etc. Be sure you always have proper shoes along so you can add a brisk walk or other activity to your day during these times, even when they are unexpected. Try to go to sleep 30 minutes earlier, to give yourself more rest and the ability to set the alarm earlier so you can exercise in the morning. Set out your exercise clothing before going to sleep so you can get dressed for your workout without thinking about it in the morning. Involve your kids in your exercise program. Choose activities that allow you to play active games together. Not only will this give you more exercise, but you will be a positive role model for your children. Figure out what time of day you have the most energy and capitalize on it. The most important thing is to get more activity into your day. If you aren't a morning person, exercise at a different time of day when you have more energy. Set small goals. By setting goals that aren't impossible, you will gain more confidence as you meet and exceed them. Soon, you will be setting higher goals and proving to yourself how strong you are. Consider exercise another part of your day as you do everything else that needs to be done. Set a time and stick to it, just as you would with work, hygiene, etc. If you are suffering from an injury, ask your physician about what activities you can do. Don't assume one injury means you must be completely inactive. Perhaps if you have a lower body injury, you can still do some upper body strengthening or seated shadow boxing to elevate your heart rate. If you have an upper body injury, maybe you can still do some cardio work. Allow your body to heal, so you can get back to your exercise program. Listen to your doctor and be kind to yourself during this process. Do you have more obstacles in your path to consistent exercise? Share them and we'll find ways to work through them. Happy Valentine's Day, Dear Readers! Whether you have that one certain special "someone" in your life or not, I want you to know I'm sending out positive energy for feelings of love, peace, joy, and happiness to all of you. Living a healthy lifestyle will reap all these awards, and more... You will become happy with yourself, allowing your heart to open up to others and letting love flow to not only your current family and friends, but also out to the world. And, our world can use all the love and positive energy it can get. If you have been thinking about making changes in your life to become healthier, why not make today the day? What do you need to make these desires a reality? Let me know. Because I know, Success Can Be Yours! Perhaps, just perhaps, together we can make it happen. Let's start! What do you need to make your desires for a healthier YOU a reality? I remember lunchtime when I had an office job. It was a much needed mental break and one of my few available times to socialize with friends. Is lunchtime a social time for you too? If you are trying to lose or maintain your weight, or even just living a healthy lifestyle, social lunches can be tricky. I've come up with some tips to help you keep your social lunch dates without breaking the healthy living bank. Be the first to suggest a healthy restaurant. If your group is like mine, there is often a conversation about where to go. Do some research and find the healthiest restaurants close to you. Most restaurants post nutrition facts online now (and, with a search engine, you can find this information even if they don't provide it). By doing this ahead of time, you'll have an arsenal of healthier choices. Learn how to be a high maintenance customer, asking for what you want. Ask to substitute steamed veggies instead of fries or other heavy starches. Ask for your meat not to be breaded and grilled with no butter or oils. If you are at a fast food restaurant, order a side salad with the dressing on the side instead of fries and ask if they have whole wheat bread instead of white. If you do eat at a restaurant, be sure to increase your water intake to help flush out the extra sodium. Suggest a potluck lunch. You could do this every day in a variety of ways. Create daily themes and assignments. Use this opportunity to teach your friends about healthy cooking. Perhaps you rotate who is responsible for bringing lunch rather than everyone doing it daily. Just be sure you are all on the same page with healthy choices. If you find you are the only one making healthy eating choices, be sure what you bring is something you can eat and feel satisfied with. Suggest lunch in a local park, each bringing their own food. Suggest a walking lunch, complete with a lunch you can easily eat on the go (that you prepared yourself). Just because you want to be healthy, doesn't mean you need to let go of your social time with friends. Mix up the tips above for a variety of ways to continue having fun with friends, while maintaining your healthy lifestyle. If you are persistent, I bet your friends will be inspired to join you. I recently said something was impossible for me. I was wrong. I know I should never think something is impossible, yet I fall victim to those thoughts. Do you? My bet is you do. The best we can do is continue to remind ourselves we are stronger than we think we are. And, we can push ourselves beyond our comfort zones to prove just how strong we are. Maybe you've seen the Dallas/Ft. Worth area in the news over the last couple days. We have had an unusually cold weather pattern come through, bringing with it very icy conditions. Basically, our metro has come to a halt. One such halt was my plans for a yoga workout on Tuesday. However, David and I didn't let that stop us. We ventured out to the gym to get in some cardio and strength training. I hopped on the treadmill, warmed up with a brisk walk, then started jogging. I very quickly became bored, as I always do on a treadmill. So, what did I do? Well, I didn't stop like I wanted to. I decided it was a day for sprints. My jogging speed is around 6 mph, so I decided to bump up my speed for 1 minute at 7 mph. Well, that worked. So, after a 1 minute recovery, I did a minute at 7.5 mph. I kept bumping up my speed, next doing a minute at 8 mph. I finally got brave enough to try 9 mph, and I did it for 30 seconds! I then skipped right to 10 mph and sprinted for 30 seconds, for three separate sprints. Wow! I couldn't believe it. I doubted myself, saying something was impossible. I am stronger than I thought I was. I pushed into my uncomfortable zone and proved how strong I am. You can too! What are you afraid of? What seems impossible for you? Let's prove how strong you are! My name is Sheila and I am an AFAA certified personal fitness trainer, an SCW Fitness certified boot camp instructor, and a Schwinn certified indoor cycling instructor. I have been through the weight loss journey myself and I am excited to help you through yours! TGIF! Are you too busy for exercise? Pilates Reformer - The Housewife Workout?